Static Dusters Set of 3 is rated 4.2 out of 5 by 31. The static charge created by these handy dusters attracts dirt like a super-powered magnet. 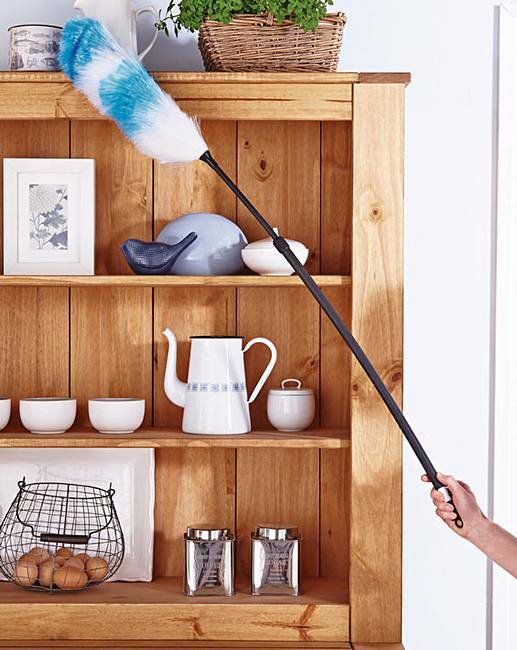 The smallest duster is great on fiddly items like ornaments; use the medium duster for general cleaning; and the retractable duster for high and hard-to-reach places. Short – L: 9 ½in. Medium – L: 22in. Long – L: 38in (extendable to 43in). Rated 1 out of 5 by jackiediddle from Very poor product I purchased these static dusters as I have been having problems with back. They are very flimsy and each time I use them fibres keep falling off. Wish now I had purchased static duster locally. Rated 4 out of 5 by Miss P from Really useful Had this a couple of weeks now and find it great, not just for high up stuff but low down, such as round the shower base in a narrow channel. Rated 4 out of 5 by Babs from Good product Replaced my old dusters. These are great, especially extension for height and skirting boards. Rated 2 out of 5 by El Leon from Cheap and not so cheerful They looked good in the mag but were not so good on delivery. Rated 5 out of 5 by Chris D from Great product I bought these a few weeks ago and i am very pleased with them. Rated 4 out of 5 by babs 123 from Static Dusters Brilliant thank you use them all the time very good really good on cobwebs. Rated 5 out of 5 by Dee from Great dusters Great fr getting into difficult spaces and handy having different lengths.